The Qinghai – Tibet Railway runs a length of 1,956 kilometers and connects the capital city of Qinghai Province, Xining, with the capital city of Tibet, Lhasa. 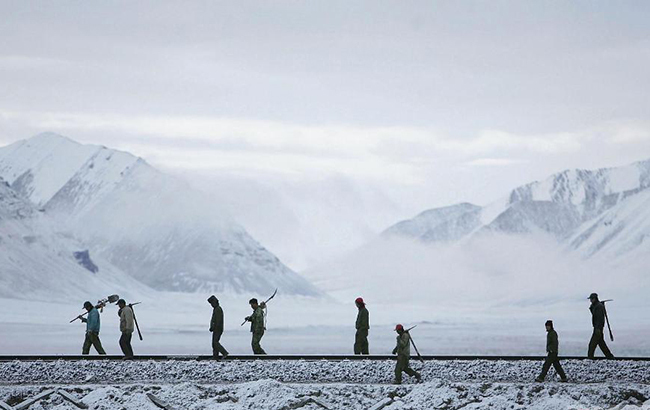 The world’s highest railway was also the first railway ever in all of Tibet. 960 kilometers of the Qinghai – Tibet Railway is situated at 4,000 meters above sea level, which required designers and engineers to solve numerous difficulties in its construction. There were three major challenges to building this high-altitude railway: the fragile ecosystem that it traveled through, the low oxygen at that altitude, and the state of the permafrost that would support the railway. Many foreign experts had thought that these difficulties would be impossible to overcome, but the Qinghai – Tibet Railway stands now as a miracle of modern engineering. Since the inception of its operation, the Qinghai-Tibet Railway has become one of the busiest railways in Asia. Millions of travelers flock to the Qinghai-Tibet Plateau to experience this engineering marvel as it travels through the spectacular scenery of southwestern China. Travel Tibet China has collected abundant information about the construction of the highest railway in the world, including how the engineers overcame the challenges of its construction and the impact of the railway on society and the environment. We also have information on how travelers can take the train to Lhasa, how to book train tickets to Tibet, what travelers will experience along the railroad, etc. Qinghai-Tibet Railway or Qingzang railway starts from Xining Qinghai, westward to Lhasa, Tibet Autonomous Region, passing through Nachitai, Wudao Liang, Tuotuo River, Yanshiping, over the Tanggula Mountains, via Tibet Amdo, Nagqu, Dangxiong, Yangbajin to Lhasa. Along the railway, the section built on the altitude above 4,000 meters is 960 km, the section of the railway on permafrost is 550 km. The highest point of the railway on Tanggula Mountain is 5072 meters above sea level. Qinghai-Tibet Railway is the world's highest and longest plateau railway. Most parts of the Qinghai-Tibet Railway are located on the high altitude areas and the depopulated zones. It must overcome the permafrost, high altitude, ecologically fragile, bad weather, and the four problems. Until March 25, 2006, the Qinghai-Tibet Railway project with a total investment of 28.5 billion yuan, of which environmental projects for investment reached 1.2 billion yuan, which is quite rare among the individual projects for environmental protection in the world. The total length of Qingzang railway is 1,956 km. Construction of the 815km section between Xining, the capital city of Qinghai Province and Golmud was completed by 1984. The 1,142 km section between Golmud and Lhasa was inaugurated on 1 July 2006. The first two passenger trains were ‘Qing 1' (Q1) from Golmud to Lhasa, and ‘Zang 2' (J2) from Lhasa. This railway is the first to connect China proper with the Tibet Autonomous Region, which is due to Tibet's altitude and terrain. Testing of the line and equipment started on 1 May 2006. Trains run from Beijing, Chengdu, Chongqing, Xining and Lanzhou. The line includes the Tanggula Pass, at 5,072m (16,640 feet) above sea level the world's highest rail track. The 1,338 m Fenghuoshan Tunnel is the highest rail tunnel in the world, at 4,905m above sea level. The 3,345-meter Yangbajing Tunnel is the longest tunnel on the line. It is 4,264m above sea level, 80km northwest of Lhasa. 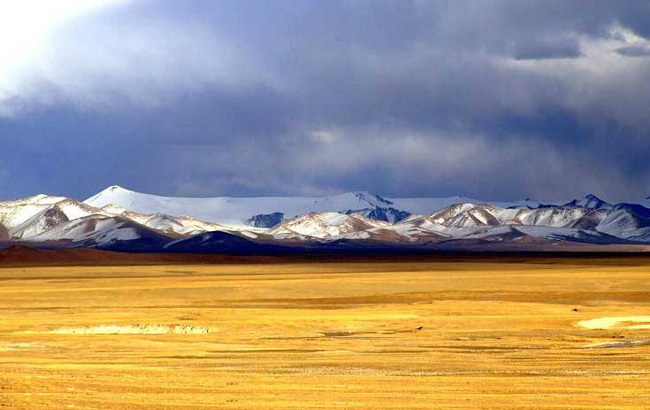 More than 960km, or over 80% of the Golmud-Lhasa section, is at an altitude of more than 4,000m. There are 675 bridges, totaling 159.88km, and over half the length of the railway is laid on permafrost. In the Golmud to Lhasa part of the line, 45 stations are open, 38 of which are unstaffed, monitored in the control center in Xining. 13 more stations are planned. • World’s highest railway: Along the railway, the section built on the altitude above 4,000 meters is 960 km,. The highest point of the railway on Tanggula Mountain is 5072 meters above sea level. Qinghai-Tibet Railway is the world's highest and longest plateau railway. • The world's highest plateau permafrost tunnel: The Fenghuoshan tunnel is located on Fenghuoshan Mountain with an altitude of 5010 meter. It is totally 1338 meters long. The elevation of track surface is 4905 meters above sea level, all located within a permanent plateau permafrost. It is currently the world's highest and longest permafrost tunnel across the permafrost zone on plateau. • The world's longest plateau permafrost tunnel: With the length of 1686 meters, and 4648 meters above sea level, Kunlun Mountain Tunnel is the world's longest plateau permafrost tunnel. • The world's longest railway bridge: Qingshui River Bridge with an altitude of over 4500 meters is located at the Hoh Xil’s no man's land. 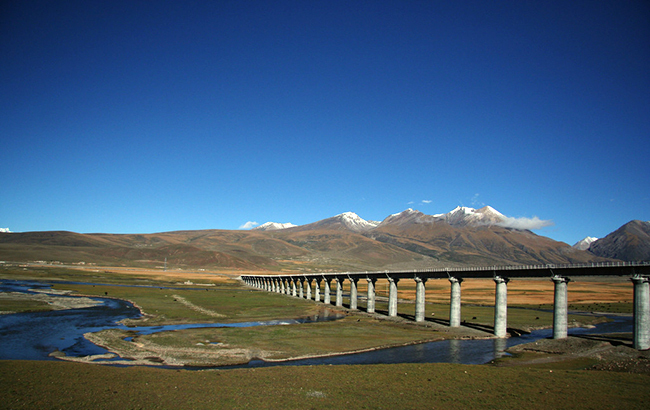 It is 11.7 km long, and is the longest giant railway bridge along the Qinghai-Tibet railway. • Word’s highest railway bridge: Qinghai-Tibet Railway’s highest railway bridge is located at the north ridge of Kunlun Mountains, 15 away from Nachitai. It is over 3800 m above the sea level. Why did China build Railway to Tibet ? Both economic and geographic difficulties were encountered in the construction of this most elevated railroad. As is well known, such a feat of engineering must require huge investment, which was a big challenge for China at the time. But, the biggest challenges lay in the harsh geographic conditions on the high plateau. The fragile ecosystem on the Qinghai-Tibet Plateau, and also the lack of oxygen at the high-altitude, and the permafrost were major problems which made the construction of Qinghai-Tibet Railway specifically eventful. Reputed as “the sky road”, the railway itself is a great wonder without doubt. Of course, the breathtaking scenery gives additional attraction to this charming rail-track. Journey of Qinghai Tibet Railway is extraordinary,exiting experience, especially the train climb up to Qinghai Tibet Pleatau from Xinning. Do not miss any moment of extraordinary nature which you will watch trough the window of the train. This magic railway goes through the distant lofty mountains, green rivers, blue lakes green oasis and prairie... changeable sky makes rain, snow, sun and incredible weather. Currently, seven cities from all directions in mainland China offer direct trains to Lhasa. They are Beijing in north Shanghai in east, Guangzhou in south, Chengdu and Chongqing in central, Xining and Lanzhou in west. But it does not indicate that you can board a train to Tibet only in these cities. 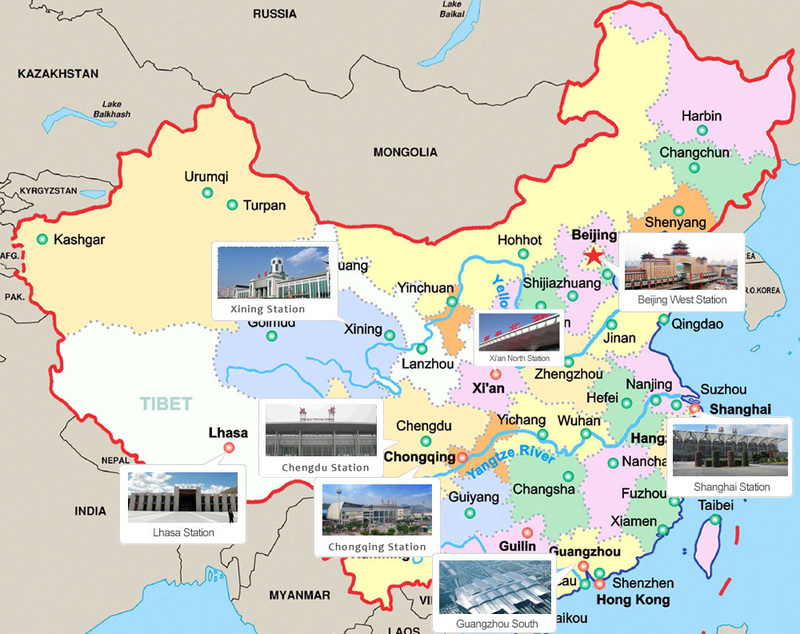 Trains to Tibet pass through many important cities in China, like Nanjing, Zhengzhou, Xian, Changsha and Taiyuan. 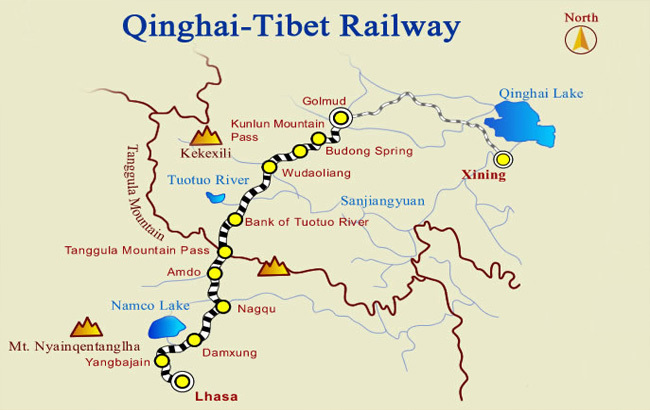 However, what is the best city to start train journey to Tibet, Qinghai Tibet Railway Map drews even railway lines from China to Tibet and also gives the most authoritative overall review of 7 major railway lines from China to Tibet. 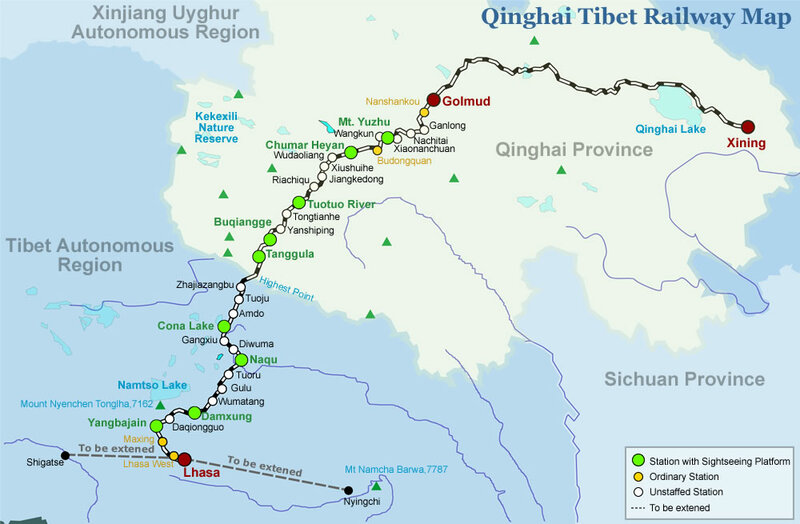 Travel Tibet China offers brief introduction to Qinghai Tibet Railway: overall basic information about Qinghai-Tibet Railway, Tibet Train schedule, Tibet Train tickets booking, etc. As an experienced local travel agency, we are here to help you with your once-in-a-lifetime Tibet tour.